Safe and effective, 7Q Spa’s VI Peel’s versatility, low cost, and fast results continue to make it one of the most popular skin care treatments in Glendale. Ideal for all skin types and for clients of any age, the VI Peel works by gently stimulating the body’s collagen growth and elastin production, drastically improving the appearance of imperfections like hyperpigmentation (Melasma), acne and acne scarring, loss of firmness due to aging, Rosacea, and sun-damaged skin in as few as seven days! Also, unlike other chemical peels, the VI Peel treatment is virtually painless and requires no skin conditioning. 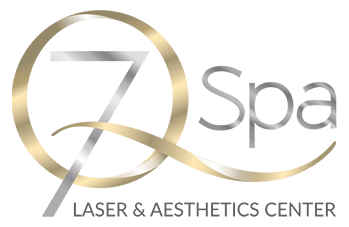 Get the radiant, younger-looking skin you’ve always wanted; schedule a free consultation with one of 7Q Spa’s friendly physicians, nurses, or technicians today! Unlike older-generation chemical peels that can require up to five months of preconditioning treatment, the VI Peel may be applied right away, thus allowing clients to experience the smoothing, skin-tightening results almost immediately. During the application process, it is common for one to feel a tingling or faint stinging sensation; this momentary discomfort gives way to numbness within a few seconds. If the client desires, cold air may be blown on the treatment area to soothe the effects of the treatment. After the VI Peel is complete, the treated area is cleaned, moisturized, and protected with VI Derm skin care products. Typically, the skin will look slightly tan or red immediately following the treatment and, after three days, will begin lightly peeling. Clients usually experience a “tightness” during this time, and pigmented areas may also appear slightly darker—a sign that the Peel is working! By the sixth or seventh day, the peeling should dissipate completely, revealing blemish-free, younger-looking skin. For the best results, 7Q Spa’s physicians recommend clients schedule VI Peel treatments every three to six months, depending on their individual skin conditions.